Before we launch into “second summer” with November's slate of tentpole releases, there's a bit of a palate cleanser on offer – clearing out space between October's quality and November's quantity, by way of a franchise we all kind of assumed had run its course. 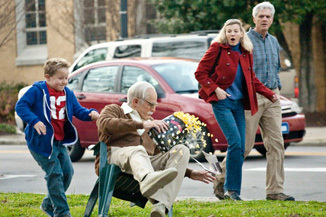 The Jackass guys – and more specifically Johnny Knoxville – are back after finding a new gimmick in Bad Grandpa. Knoxville, dressed up in old-man makeup, plays an 86 year-old man escorting his eight-year-old grandson across the country. Along the way, Knoxville acts the provocateur, injecting his skeevy old man behaviors into real-life situations, essentially trolling the public. There's also the standard Jackass risking-personal-injury bit as well, with the commercials notably highlighting Knoxville being launched through a plate-glass window on a mechanical horse. This is essentially Jackass's version of Borat, with Knoxville going deep undercover to elicit “real” reactions from real people, and recognizing that he himself would be way too widely recognized for this to work without the gimmick. You could also read some things into this about how much we're willing to let old people and children get away with societally, but this is still Jackass and not a Master's thesis. The original trilogy of Jackass movies were popular beyond all expectations, opening to over $20 million for the first two, and an astounding $50 million in a 3D version. While this is a bit of a rebranding, it's still within the same universe as those movies and ought to carry forward a lot of the Jackass audience. The box office here will be a bit of a referendum on how successfully Paramount has been able to make that connection for fans. It feels like they've been decently effective at that, and we should see an opening weekend of about $32 million. Fans of more traditional fare have The Counselor to look forward to, the latest from Ridley Scott. Michael Fassbender stars (amidst a tremendously deep cast) as a lawyer who dives into the world of international drug trafficking and quickly finds himself in over his head with a Mexican cartel. Suspense and thrills ensue as the situation spirals wildly out of control and more and more dangerous characters enter the picture.